A powerful support. This supplement was added to the range of De Paardendrogist last summer and there are already many positive reactions to this product. It supports the immune system, digestion, skin and joints of your horse; so it is a multifunctional supplement. This powerful mix contains, among other things, turmeric, ginger and black pepper to promote natural resistance. 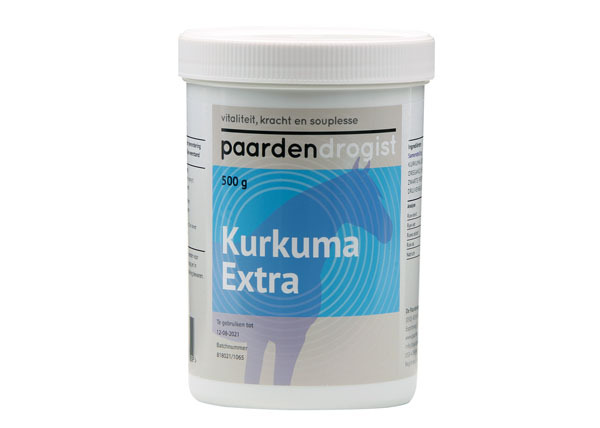 For an even better absorption, Kurkuma Extra can be fed in combination with linseed oil. For when your horse needs that little bit extra.